Range: Arctic regions, south to alpine regions of northern New England and northern New York. Aids to Identification: Carex is a large and difficult genus, and technical characters must be relied upon to separate the species. The combination of bifid stigmas, leuticular achenes, and separate staminate and carpellate spikes will separate this sedge from all others occurring in the alpine community. Carex bigelowii is a short (typically less than 50 cm) perennial herb that grows along creeping surface runners (stolons). 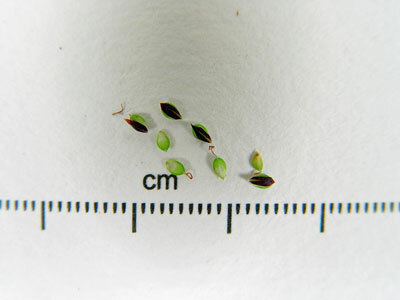 The inflorescense, which usually exceeds the dark green leaves, contains a terminal staminate (male) spike on a slender stem and 1 to 6 lower pistillate (female) spikes that lack stems. The scales (small bracts that cover each periginium) are distinctly purple with a pale midrib. Ecological characteristics: Locally common above treeline with other alpine plants such as alpine bilberry (Vaccinium uliginosum). Rarely occurs below treeline. This sedge is the only Carex found commonly in alpine ridge communities and is often the dominant plant in certain patches forming a tuft. Phenology: Flowers July - September. Synonyms: Represented in New England and Maine by ssp. bigelowii. Synonyms include Carex rigida Goodenough; Carex rigida Goodenough var. bigelowii (Torr. ex Schwein.) 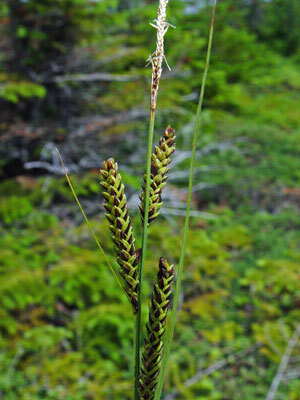 Tuckerman; Carex rigida var. concolor (R. Br.) Kükenth. Known Distribution in Maine: This rare plant has been documented from a total of 15 town(s) in the following county(ies): Franklin, Hancock, Oxford, Piscataquis, Somerset. Reason(s) for rarity: Southern limit of range. Conservation considerations: Can occur in large populations, and appears to be fairly secure at some of its locations; however, populations could be threatened by heavy hiking use.